Supreme Science Selective rabbit food is a nutritionally complete and balanced diet for rabbits with tasty Aniseed & Fenugreek. This food is created from a blend of high quality ingredients, formulated to provide a nutritionally complete and balanced diet. Supreme Science ensures your rabbit will not selectively feed on favourite ingredients in coarse mixed diets and provides additional benefitsdesigned to ensure the health and well being of your rabbit. With a high fibre level (23%) Rabbits will have a healthy gut and good dental wear. 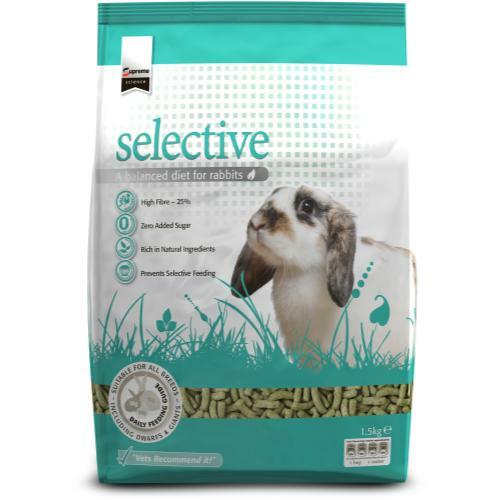 It's a fully extruded diet designed to prevent selective feeding, while helping beneficial bacteria in rabbit digestive systems. Feeding guidelines: The average adult rabbit will require approximatley 60-70g per day of Supreme Science Selective rabbit food. This product can be fed as desired, however, weight and wellbeing should be monitored regularly. Fresh water and hay should always be avalible. Ingredients: Alfalfa meal, soybean hulls, wheat, wheat feed, flaked peas, linseed (2%), beet plup, soybean, meal, soya oil, monocalcium phosphate, salt, calaium carbonate, anise and fenugreek oil (0.2%). May contain genetically modified soya.